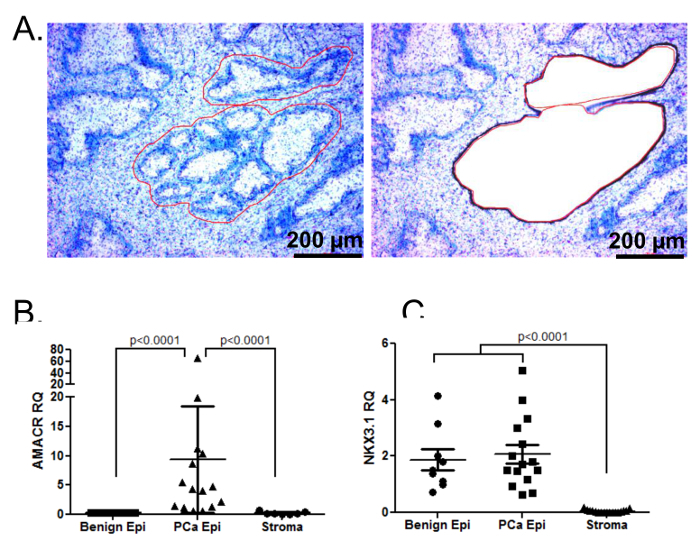 The goal of this protocol is to use laser-capture micro-dissection as an effective method to isolate pure populations of cell types from heterogeneous prostate tissues for downstream RNA analysis. Lugli, G., Kataria, Y., Richards, Z., Gann, P., Zhou, X., Nonn, L. Laser-capture Microdissection of Human Prostatic Epithelium for RNA Analysis. J. Vis. Exp. (105), e53405, doi:10.3791/53405 (2015). The prostate gland contains a heterogeneous milieu of stromal, epithelial, neuroendocrine and immune cell types. Healthy prostate is comprised of fibromuscular stroma surrounding discrete epithelial-lined secretory lumens and a very small population of immune and neuroendocrine cells. In contrast, areas of prostate cancer have increased dysplastic luminal epithelium with greatly reduced or absent stromal population. Given the profound difference between stromal and epithelial cell types, it is imperative to separate the cell types for any type of downstream molecular analysis. Despite this knowledge, the bulk of gene expression studies compare benign prostate to cancer without micro-dissection, leading to stromal bias in the benign samples. Laser-capture micro-dissection (LCM) is an effective method to physically separate different cell types from a specimen section. The goal of this protocol is to show that RNA can be successfully isolated from LCM-collected human prostatic epithelium and used for downstream gene expression studies such as RT-qPCR and RNAseq. The prostate gland is a heterogeneous tissue composed of secretory epithelium arranged in glandular acini surrounded by fibromuscular stroma composed primarily of smooth muscle1. The epithelial compartment is comprised of five different but organized cell types: basal cells, secretory cells, neuroendocrine cells, transit amplifying cells and stem cells2. In prostate cancer (PCa), which arises from the luminal epithelial cells, the growth of the adenocarcinoma causes an evident progressive decline of the stromal compartment3. For these reasons, tissue specimens will have distinct differences in the proportion of stromal and epithelial cell type based on the extent of PCa. These differences can lead to biased assumptions of the gene expression data acquired from whole tissues without regard to microdissection of the desired cell type. Therefore, to remove this bias it is essential to separate cell types prior to RNA extraction and gene expression analysis. Macrodissection or microdissection can be used to physically separate well-characterized epithelial areas from the surrounding stroma4-6. Macrodissection is typically done with a razor blade under a dissecting microscope and works well for separating large PCa nodules from stroma, but is not capable of removing benign epithelium from surrounding stroma (see example of benign prostate histology in Figure 1). Microdissection with a laser (LCM) is significantly more labor intensive than macrodissection, but can very accurately dissect benign epithelium4. Recent publications from our lab have shown that RNA can be successfully extracted by LCM from either formalin-fixed paraffin-embedded (FFPE) biopsies or frozen tissue4,7-9. The major challenges in LCM-RNA extraction are 1) to accurately dissect the desired areas of the tissue, and 2) to preserve RNA integrity during the LCM and isolation process4,10. RNA isolated from pure cell populations can be used for gene expression analysis by several methods including reverse-transcription quantitative PCR (RT-qPCR)7,8, microarray11, and deep -sequencing12-14. The goal of this protocol is to isolate total RNA from LCM prostatic epithelium from frozen tissue for downstream gene expression analyses. All human tissues used for these experiments were acquired via an Institutional Review Board approved protocol and/or exemption at University of Illinois at Chicago. The day before or a few hours before sectioning the sample, clean tools (i.e., brush, forceps, coplins, blades, PEN-framed slides (if not already RNase free), an ETOH safe marker and a pencil) and the inside of a RT cryostat with RNase-decontaminating solution using a spray bottle and lab-wipes. Allow RNase-decontaminating solution to sit for 5 min before wiping away, rinse with depcH20 to remove left over RNase-decontaminating solution and a final rinse with 70% EtOH (prepared with depcH20). Note: It is essential to maintain an RNase-free workspace. All coplins, tools, frozen mounting medium, blades and slides used should be used only for RNase free work and never used in a standard non-RNase free environment. All instruments must be treated with an RNase decontamination solution before each experiment. Cool cryostat to -24 °C. Place the following cleaned RNase free instruments inside cryostat to cool at least 30 min prior to sectioning: slide coplin-filled with 100% ethanol, tools, small frozen tissue cassettes and mounting chuck. Retrieve frozen prostate tissue from cryostorage and place into a dry-ice-filled foam bucket for transport. Place tissue into cryostat to equilibrate to cryostat temperature for at least 30 min. Note: Human prostate tissues for laser-capture micro-dissection can be either fresh-frozen or formalin-fixed paraffin-embedded (FFPE). The time constraints and slide preparation are slightly different between tissue sources. Here we describe the steps for frozen sections. Work with one tissue at a time, and squirt frozen mounting medium into the bottom of the cassette and quickly mount the frozen prostate tissue into the frozen mounting medium using the chilled forceps. Place the cassette with tissue onto chiller in cryostat for 5 min to set frozen mounting medium. Squirt a small amount of frozen mounting medium onto the chuck and carefully press mounted tissue bottom side up onto the frozen mounting medium. Let set in the cryostat for 5 min to allow the frozen mounting medium to completely solidify. Place chuck into the holder and tighten. Lock the handle in locked position and place a new blade onto the cryostat. For downstream molecular endpoints that include an amplification step (i.e., qPCR) it is advisable to use a new blade for each patient to prevent contamination (or move the blade over to use area of the blade for the next sample). Unlock the handle and carefully advance the tissue by hand or with a foot pedal to even and expose the tissue with 50 µm sections until the desired tissue exposure is reached. Adjust cryostat to 5 µm, cut one or two sections and place them onto charged glass slide for hematoxylin and eosin (H&E) staining (see Step 2). Immediately place the slide into the cold 100% ethanol for 2 min. Remove the charged glass slide from ethanol and let it dry at RT before proceeding to H&E staining (Step 2). Place RT PEN-frame slide on a frame supporter. Adjust cryostat to 10 µm and place sections onto the RT PEN frame slides. One to four sections can be place onto each slide depending on the tissue size. Immediately plunge the slide into the cold 100% ethanol for 2 min. Remove the PEN-frame slides from ethanol and store the slide in a slide box in a desiccator box in a -80 °C freezer until ready for LCM. Three days is the maximum storage time for optimal RNA recovery. Proceed with Step 2 for ONLY the charged glass slide. Proceed with Step 3 for PEN-frame slide. Note: This if for the tissue on the charged glass slide and NOT the PEN-frame slide for LCM. Hydrate the sections on the charged glass slide dipping the slide through graded ethanol as follows: dip the slide two times in 100% ethanol for 3 min, two times in 95% ethanol for 3 min, once in 70% ethanol for 3 min and two times in distilled H2O for 3 min. Dip the slide in Hematoxylin Gill II (0.4%) for 5 min. Wash off excess stain in steady running tap H2O for 3 min. Wash the slide in running tap H2O for 3 min. Dip the slide in 0.1% sodium bicarbonate solution for 30-60 sec to turn the purplish color to blue. Rinse the slide in 95% ethanol with 10 dips. Dip the slide in Eosin-Y 2-3 times for 15 sec total. Dehydrate the slide through graded ethanol as follows: dip the slide two times in 95% ethanol, two times in 100% ethanol, and two times in Xylene (make sure the tissue appears clear which indicates thorough dehydration). Mount the slide with non-aqueous permanent hard mounting medium and cover slip. Let the slide dry for 30 min. Scan slide with any whole slide scanner and print a large, high-resolution image onto 8” x 11” paper. Outline areas of interest (typically done by a board certified pathologist) with a marker. This markup is the guide for the LCM procedure. Note: This is done the SAME DAY as the LCM. Use depcH2O water for all solutions. Complete all steps in RNase-free area. All coplins must be cleaned with RNase-decontaminating solution. The day of LCM remove the PEN-frame slides from -80 °C freezer and hydrate by gently dipping slides into 90% EtOH for 2 min then 75% EtOH for 2 min. Prepare 0.5% toluidine blue by dissolving in molecular biology grade water then filter sterilize through a 0.2 µm filter and store at RT. This solution may be re-used for up to 6 months. Note: It is highly advised to prepare the solution prior to as the filtration can take a few hr. Stain the prostate tissue by gently dipping slides into 0.5% toluidine blue for 5-30 sec. Destain the tissue by washing slides 2 times in depcH2O for 15 sec followed by 75% EtOH for 30 sec to 3 min. Note: stain and destain times can be adjusted to ensure good staining. Prostate tends to over stain. Transfer PEN-frame slides to RNAase-free dry container on ice. Immediately prior to LCM, dry slide on a slide warmer at 42 °C for 15 min. Dry only the slide that will be processed and store the rest on ice until ready for them. Turn on LCM and computer in this order, microscope power, the laser key, the laser switch and then the computer. Launch the Laser Microdissection software. Use the software to control the microscope to load the slides and collection tubes. Click on “unload sample holder”, load the slide with the sections onto the microscope slide holder with the tissue facing down and insert the slide holder in the appropriate slot in the microscope, then click “continue”. Click on “unload collection tubes”, label and load 0.5 ml tubes onto tube holder and insert it in the appropriate slot in the instrument. Once caps are secured, add 35 μl of Lysis buffer to the collection caps and try to avoid bubbles. Then click “OK”. Note: If evaporation is an issue, dilute the buffer as follows: 25 µl lysis buffer with 10 µl depcH2O. In the software, select the position where the slide has been placed in the slide holder. Select the collection cap to collect the LCM specimen. Visualize and focus the slide through the computer at 10X. Use the software to calibrate the laser by selecting “Laser” then “calibrate”. Adjust the power, aperture and speed of the laser, selecting “laser” then “control” to allow the laser beam to cut the area selected completely and efficiently. Repeat adjustments until the laser cuts completely through the tissue. Using the 8” x 11” pathologist mark-up as a guide, use the “draw shape” tool to circumscribe the desired areas of epithelium in the view and avoid collecting any stroma. Note: Multiple areas can be selected within one view, but do not move to another view without first cutting by clicking the “cut shape” tool. If an area does not get completely cut by the laser use the “move and cut” tool to go over it manually. Continue moving the objective to new views and repeat laser cutting until slide is completely dissected or the desired amount of tissue has been collected (typically 100 benign glands yield 150-500 ng of RNA). (see example in Figure 1A). Carefully remove tubes from the collection holder and close the caps, being mindful of the lysis buffer and tissue in the caps. Briefly centrifuge for 30 sec to collect liquid and tissue in the bottom of the tube. Incubate the samples at 42 °C for 30 min and store at -80 °C until ready for RNA isolation. Thaw out the tubes on ice and bring the volume of the solution to 100 µl. Pre-wet the micro filter of an RNA isolation kit by applying 30 µl ofLysis Solution to the center of the filter and allow it to soak whileperforming the next two steps (at least 5 min). Add 3 µl of LCM Additive solution (provided in the kit) to the lysate and mix by vortexing for 5 sec. Centrifuge for 30 sec to collect the fluid at the bottom of the tube. Centrifuge the pre-wetted filter for ~30 sec at top speed to remove liquid. Add 1.25 volumes (in this case 129 µl) of 100 % ethanol to the lysate mixture, gently vortex or pipette up and down. **This method will recover both large and small RNA species. Load the sample onto the pre-wetted micro filter, and centrifuge at 10,000 x g for 1 min to bind the RNA to the filter. Then wash micro filter with 180 µl of “Wash solution 1,” centrifuge at 10,000 x g for 1 min. Note: From this point on all centrifugations should be done at 13,000 x g, or maximum speed. Wash filter twice with 180 µl of ”Wash solutions 2 and 3”, respectively as directed by the kit protocol. Centrifuge for 30 sec, then discard the flow through, and spin the filter for 1 min to remove residual fluid and to dry the filter. Transfer filter to a new collection tube. Warm elution solution to -95 °C (provided with the kit). Apply 10 µl of preheated elution solution to the center of the filter, close the cap and store for 5 min at RT. Then centrifuge for 1 min to elute the RNA, and repeat this step one time to yield ~20 µl of RNA. Perform the DNase I treatment for 15 min at 37 °C. Quantify the RNA by spectrophotometer with absorbance at 260 nm. The ratio of optical density at wavelengths of 260 nm and 280 nm is used to assess the purity of the RNA (see Table 1)15. Note: Gene expression of long RNA species (like mRNAs and lncRNAs) is shown in Step 6.1 and short RNA species (like microRNAs) is shown in step 6.2. Different kits are available for RT-qPCR and the amount of RNA required varies by kit (as little as 10 ng). RNA sequencing analysis is described in 6.3. Reverse transcribe (RT) the RNA to cDNA mixing 5 µl of 20 ng/µl RNA sample with 5 µl of the RT master mix (RT buffer, dNTP’s, random primers, RT enzyme, RNase inhibitor). Incubate the reaction for 25 min at 25 °C, then 120 min at 37 °C and 5 min at 85 °C. Dilute the RT reaction 1:10 with RNase free water and use 2.5 µl per 10 µl qPCR reaction with primers or primer/probe sets for the genes of interest. For microRNA expression analysis run the RT reaction by mixing 5 µl of 2-10 ng/µl RNA sample with 5 µl of the RT master mix. Note: each commercially-available PCR-based microRNA detection technology requires the use of proprietary and specific RT primers. Alternatively or in addition to RT-PCR, use next generation sequencing (RNA-seq or small-RNA-seq) to quantify different species of RNAs. Typically, use 500 ng of RNA for this procedure (Table 3) and carry out the method as indicated by the manufacturer and detection instrument. In a previous study we demonstrated the use of LCM to collect epithelial and stromal tissues to compare expression profiling by RT-qPCR of mRNA and microRNAs from frozen and FFPE prostate tissues from the same patient4. LCM is time consuming, particularly if large amount of RNA is to be collected for next-generation sequencing analysis. Therefore, it is crucial to keep the working space and tools RNase free. It is recommended to examine quality and cell-specificity controls in the RNA collected (discussed in more detail in the next paragraph). Figure 1 shows a stained prostate section on a PEN-frame slide under the microscope before and after laser-capturing benign epithelium. Once the sample is collected and the RNA is carefully extracted, it is important to assess RNA quality and quantity as shown in Table 1. It is not uncommon to observe low 260/280 nm ratios. Concentrating the RNA will improve the 260/280 nm ratios, but it may also cause loss of small RNA species. In addition to quality controls, it is crucial to examine cell type-specific controls to confirm the specificity of the laser-captured area of the tissue (Figure 1B-C). For example, in Figure 1B the expression of AMACR gene was measured to confirm prostate cancer epithelial tissue compared to normal epithelial tissue,. In Figure 1C the expression of NKX3.1 confirmed the absence of stroma in the LCM-collected sample. The quality of the RNA in the specimen can also be compareed to RNA of known, good quality RNA. 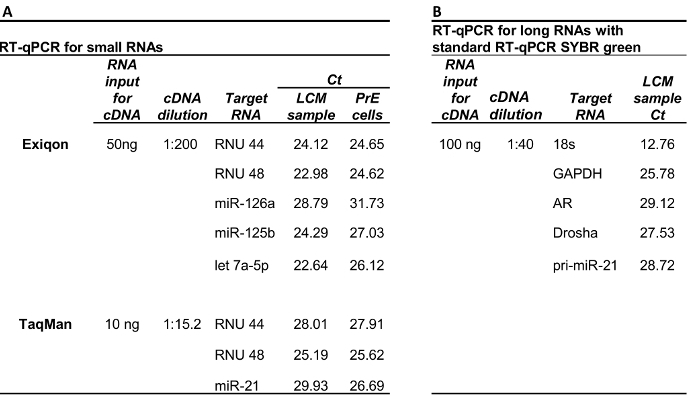 RT-qPCR Ct values for RNAs isolated from LCM-collected- tissue are in the same range as RNA collected from cultured primary epithelial cells, confirming quality of long and small RNA extracted (Table 2). Lastly, Table 3 shows that this RNA is of sufficient quality for next-generation RNA sequencing. Figure 1: Collection of benign epithelium, prostate cancer epithelium and stroma from human prostate by laser-capture micro-dissection. (A) prostate biopsy stained with toluidine blue before and after LCM-collection of the benign epithelium. (B-C) Tissues collected by LCM from 45 patients express appropriate gene markers of cellular identity7. (B) AMACR is a marker of prostate cancer and is only detectable in cancer tissues. (C) NKX3.1 is a marker of epithelium and is not detectable in stromal tissues. This figure is modified from Giangreco et al., JSBMB 20157. Please click here to view a larger version of this figure. Table 1: RNA quality and quantity from LCM-collected prostate tissue. Table 2: RT-qPCR from LCM collected Prostate benign epithelium. Table 3: RNAseq from LCM-collected prostate tissue. Gene expression profiling from human specimens can be challenging, not only for the quality or quantity of tissue available, but also for the various histological entities present in a given tissue specimen. This is particularly challenging in the prostate in which benign tissues are largely stromal tissues and areas of cancer are devoid of stroma. LCM facilitates physical separation of prostatic stroma and epithelium RNA for a more accurate signature of the two different cell types (Figure 1A). In comparison to macrodissection or whole tissue processing, LCM can separate cell compartments in benign tissues, but is significantly more costly and labor intensive. As in any technique there are possible pitfalls. For example, RNA quality can be partially degraded during initial specimen procurement or during the LCM and extraction procedure. In the first case, gene expression can be achieved measuring different short amplicons by qPCR. In the second case, scrupulous RNase free treatment of all the tools and material should be taken to prevent RNA degradation, as well as a careful handling and processing of the tissue sections. Furthermore, limiting the time spent on one slide to less than 90 min maintains RNA quality during the collection process. The biggest limitation of the LCM technique is the access to an LCM instrument and is the labor required to do the LCM. There are several types of laser-capture microdissection microscopes available. This protocol describes use of an LCM that uses the laser to circumscribe the areas, which then falls in to a collection cap below. This type of LCM is ideal for separation of epithelium and stroma in prostate tissue which contains discrete multicellular areas to collect, but this type of LCM is not suitable for isolation single individual cells from a tissue. For example, this protocol should not be used to collect resident macrophages, neuroendocrine cells or infiltrating lymphocytes, which are often present as single cells. There are other LCM instruments and methods that utilize a laser to “shoot” single cells from tissue onto a membrane cap, which facilitates isolation of these other cell types. Thorough quality control and characterization of the RNA cannot be overlooked. Absorbance at 260 nm is suitable to quantify RNA for RT-qPCR studies (Table 1), but for RNA-sequencing a dye-based method more accurately quantifies the RNA. Another important issue in RT-qPCR analysis is to avoid potential bias from residual DNA contamination. This can be accomplished by using primers that span introns. There is also high patient heterogeneity in housekeeper gene expression, therefore use of multiple housekeeper genes is suggested and we typically use three to five4,7-9 (Figure 1B-C and Table 2). The choice of gene expression profiling method is not only based on the quantity of RNA collected but also on the kind of data that one wishes to acquire and compare. Regular RT-qPCR is more sensitive than next-generation deep sequencing, and requires a relatively small amount of RNA thus decreasing the LCM procedure time4. Next-generation RNA sequencing is an effective technique to quantify the expression both for short and long RNA species. Next-generation sequencing also allows discovery of novel RNA species13. Fortunately, the cost of next-generation sequencing is declining. In summary, this protocol enables RNA isolation of homogeneous populations of epithelial or stromal cells from frozen prostate tissue. The RNA can be used for numerous downstream analysis techniques to provide a tool for accurate cell type-specific gene expression in the benign and diseased prostate. This type of data contributes to knowledge and understanding of how RNA expression differs in disease pathology. We thank Dr. Vicky Macias, Angeline Giangreco and Avani Vaishnav for assistance with optimizing this methodology over the years and Yang Zhang and Dr. Jian Ma at the University of Illinois at Urbana-Champaign for the RNA seq analysis. This work was supported by NIH/NCI R01 CA166588-01 (Nonn), American Cancer Society Research Scholar 124264-RSG-13-012-01-CNE (Nonn), NIH/NCI R03 CA172827-01 (Nonn), DOD-CDMPR PRCP Health Disparities Idea Award PC121923 (Nonn) and a Prevent Cancer Foundation grant (Zhou). Schauer, I. G., Rowley, D. R. The functional role of reactive stroma in benign prostatic hyperplasia. Differentiation. 82, 200-210 (2011). Peehl, D. M. Primary cell cultures as models of prostate cancer development. Endocrine-related cancer. 12, 19-47 (2005). McNeal, J. E., Haillot, O. Patterns of spread of adenocarcinoma in the prostate as related to cancer volume. The Prostate. 49, 48-57 (2001). Nonn, L., Vaishnav, A., Gallagher, L., Gann, P. H. mRNA and micro-RNA expression analysis in laser-capture microdissected prostate biopsies: valuable tool for risk assessment and prevention trials. Experimental and molecular pathology. 88, 45-51 (2010). Long, Q., et al. Global transcriptome analysis of formalin-fixed prostate cancer specimens identifies biomarkers of disease recurrence. Cancer research. 74, 3228-3237 (2014). Long, Q., et al. Protein-coding and microRNA biomarkers of recurrence of prostate cancer following radical prostatectomy. The American journal of pathology. 179, 46-54 (2011). Giangreco, A. A., et al. Differential expression and regulation of vitamin D hydroxylases and inflammatory genes in prostate stroma and epithelium by 1,25-dihydroxyvitamin D in men with prostate cancer and an in vitro. model. The Journal of steroid biochemistry and molecular biology. (2014). Giangreco, A. A., et al. Tumor suppressor microRNAs, miR-100 and -125b, are regulated by 1,25-dihydroxyvitamin D in primary prostate cells and in patient tissue. Cancer prevention research. 6, 483-494 (2013). Mihelich, B. L., et al. miR-183-96-182 cluster is overexpressed in prostate tissue and regulates zinc homeostasis in prostate cells. The Journal of biological chemistry. 286, 44503-44511 (2011). Bevilacqua, C., Makhzami, S., Helbling, J. C., Defrenaix, P., Martin, P. Maintaining RNA integrity in a homogeneous population of mammary epithelial cells isolated by Laser Capture Microdissection. BMC cell biology. 11, 95 (2010). Gregg, J. L., Brown, K. E., Mintz, E. M., Piontkivska, H., Fraizer, G. C. Analysis of gene expression in prostate cancer epithelial and interstitial stromal cells using laser capture microdissection. BMC cancer. 10, 165 (2010). Hart, M., et al. Comparative microRNA profiling of prostate carcinomas with increasing tumor stage by deep sequencing. Molecular cancer research : MCR. 12, 250-263 (2014). Smalheiser, N. R., Lugli, G., Thimmapuram, J., Cook, E. H., Larson, J. Endogenous siRNAs and noncoding RNA-derived small RNAs are expressed in adult mouse hippocampus and are up-regulated in olfactory discrimination training. Rna. 17, 166-181 (2011). Song, C., et al. Expression profile analysis of microRNAs in prostate cancer by next-generation sequencing. The Prostate. 75, 500-516 (2015). Deng, M. Y., Wang, H., Ward, G. B., Beckham, T. R., McKenna, T. S. Comparison of six RNA extraction methods for the detection of classical swine fever virus by real-time and conventional reverse transcription-PCR. Journal of veterinary diagnostic investigation : official publication of the American Association of Veterinary Laboratory Diagnosticians, Inc. 17, 574-578 (2005). Kong, H., et al. Quantitative assessment of short amplicons in FFPE-derived long-chain RNA. Scientific reports. 4, 7246 (2014).